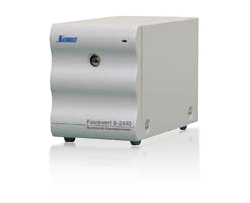 This spectroradiometer was designed with many years of Soma Optics’ technology integration. Despite its small and compact size, it measures the wavelength from 300 to 1,100nm. It is able to measure solar light or outdoor sunlight. Classification of solar simulator is calculated and indicated; It is an ideal equipment to measure solar light for solar cell evaluation. The measurement probe head uses a reflective diffuser, and is connected to a spectrometer via an optical fiber for smooth measurement. * The specifications and outer shape may be changed without notification.